Editor's note: This story originally appeared on CNN.com on October 20. Barack Obama mentioned Ann Nixon Cooper on Tuesday in his presidential victory speech. 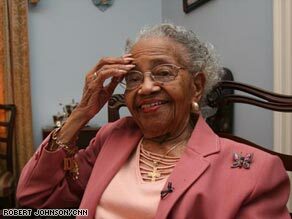 Ann Nixon Cooper, 106 years old, lived during a time when blacks and women did not have the right to vote. ATLANTA, Georgia (CNN) -- Ann Nixon Cooper, 106 years old, has seen presidents come and go in her lifetime and has outlived most of them. On a sunny fall morning, she left her weathered but well-kept Tudor home in Atlanta, Georgia, to vote early -- this time for Barack Obama. The African-American centenarian remembers a time not long ago when she was barred from voting because of her race. Now she hopes to see the day that Obama is elected as the nation's first black president. "I ain't got time to die," Cooper said with a smile. At the Fulton County government center, Cooper was greeted by Atlanta Mayor Shirley Franklin. "I thought that I would accompany her today to support her, but also to say to all people that this is a choice we have," Franklin said. Cooper, in a wheelchair and helped by two caretakers, bypassed the long lines of early voters and headed right to the voting machine. Her 106-year-old hands reached out to the 21st-century touch screen to cast her vote for Obama. She and her late husband, prominent dentist Dr. Albert Cooper, raised four children in this house. "Our days and nights were just social affairs," she said. The home was a center of Atlanta's black society and the scene of many parties. Celebrities, including the late singer Nat King Cole, dropped in to visit. "It's been a house with a heap of living going on in it," said Cooper. She wears a charm bracelet that former U.S. ambassador to the U.N. and Atlanta Mayor Andrew Young gave her when she turned 99. "He adds a charm every year," said friend and caretaker Sally Warner. "Andy says he will have to apply for a loan soon to keep up with Mrs. Cooper." Cooper danced the electric slide up until the age of 103. She has recently slowed down after suffering several heart attacks and a fractured hip. On a typical day, Cooper spends hours watching television in her wood-paneled sitting room. "Her favorite show is 'The Price is Right,' although she is getting used to Drew Carey as the new host," said Warner. Other favorite shows include "Oprah" and "Dancing with the Stars." When the weather is nice, Cooper spends afternoons on her screened porch, watching traffic go by and reminiscing about old times. Occasionally she leaves the house for an outing. Cooper was born in Shelbyville, Tennessee, in 1902. She grew up in Nashville with uncles and an aunt who worked as a domestic for wealthy whites. She married Albert Cooper in Nashville in 1922, and the couple moved to Atlanta. Three of Cooper's four children have died; her surviving daughter is 83. She has 14 grandchildren living and many great-grandchildren and great-great-grandchildren. When asked about the secret to her longevity, Cooper said, "I don't know how it happened, but being cheerful had a lot to do with it. I've always been a happy person, a giggling person -- a wide-mouthed person!" To young people, Cooper offers this advice: "Keep smiling. No matter what, you get out and vote. Vote your choice."